Welcome to the Yarnings Podcast, episode 101. Recorded Thursday, December 22, 2016. It's cloudy with spots of rain and 37° in Vancouver, WA this afternoon. getting in the holiday mood with crafting! playing, listening, and watching fun stuff. I'd love to know more about YOU, visit the "Introduce Yourself" thread and get to know other group members too. FO: Finished Object; WIP: Work in Progress; NAP: Needle Adjacent Project, soon to be cast on; SAP: Spindle Adjacent Project, soon to be spun up; Queue: a list of what's up next; KAL: knit a long; Stash: yarn I own waiting to be used. Lifestories: celebrating the holidays. family weekend, sickness slowed things down. 12 days of Christmas! FO: Kaylee Walks on the Sun - Sunwalker for the bigbadbergalong. Uses my handspun Kaylee's Parasol from Hobbledehoy and some Wollmeise from a destash. hibernating WIP: Botanical Baddie Bees socks, the Euglassia Watsonia socks by Dami Almon of the Geeky Girls Knit videocast. 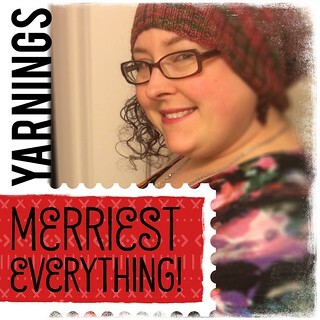 celebrating 100 episodes: share your yarnings memories in the thread on the ravelry group. prizes given. Sagas of Geekery: Now Watching: signed up for Hulu trial so I could get caught up to Once Upon a Time season 6 and Grey's Anatomy. finished The 100 season 3, and now onto Colony season 1 on Netflix. Sagas of Geekery: Now Listening: Christmas Music! mentioned Hillsong's We Have a Savior, Sarah MacLaclan, and Leslie Odom, Jr.
Fanciful Chatter: 2014's holiday project, Christmas Sockhead and bee necklaces. Book of Cooking: a cake for E out of Cake Magic. tonight will be Christmas Enchiladas. Christmas cookie and ginger brittle baking needs to commence. Happiness Continues: breathe. let myself relax. 12 days of Christmas can still feature stuff I want to enjoy about the holidays that I didn't get to! Thanks for visiting, come again! ♥ kristine. © 2000-2010.